Turbine Design: Twin Dual-Nozzle Peltons. These photos offer a glimpse of the entire construction process of the La Esperanza project in Honduras. The twin Pelton turbines were designed and manufactured by Canyon Hydro. Setting the first Canyon Pelton runner into its housing. Intake system under construction from below. Intake system under construction from above. Penstock at bend toward powerhouse. Preliminary assembly of of twin turbine housings during fabrication at Canyon Hydro. Test fitting of turbine intake bifurcation during fabrication at Canyon Hydro. Canyon vice president Richard New (left) and Shop Foreman Loren Sweitzer. Powerhouse under construction, positioning Canyon intake bifurcation and valves to feed the twin turbines. Inside of powerhouse during construction, readying penstock for Canyon Hydro Turbine #1. Twin Canyon Hydro turbine housings with generators in place. Pelton runner in place on Turbine #1. Turbine #1 with runner in place. Canyon Hydro President Dan New, center. View of Turbine #1 from penstock. Inside the completed powerhouse. Catwalk provides access to variable needle nozzle on one of the Canyon Hydro turbines. Inside the completed La Esperanza powerhouse. 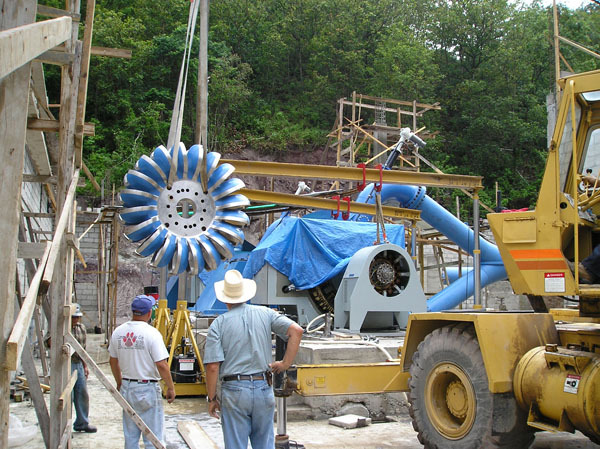 Canyon Hydro designed and manufactured the twin Pelton turbines, and provided generators and switchgear as part of its water-to-wire system.